Eczema, sometimes also referred to as dermatitis, is a skin condition characterized by dry, itchy skin that is often red, broken or cracked. Eczema is common in people of all ages, but is primarily seen in children. Around one in five children in the UK receive treatment for eczema before the age of 13 with adult sufferers numbering around one in twelve. Conventional treatments for eczema range from antibiotics to Corticosteroid tablets which are known to have serious side effects, including loss of calcium from the bones (osteoporosis) as well as thinning of the skin. Apple cider vinegar is a powerful, natural astringent made from distilled apples that has been used for thousands of years for its health properties. One of Cider Vinegar's most unique benefits is its ability to treat skin conditions including eczema and psoriasis. ACV is packed full of Vitamins and Minerals, including Beta-Carotene, Sodium, Magnesium, Potassium, Calcium, Iron, Phosphorous, Sulphur and Iron. ACV is a great source of amino acids. The powerful antioxidant action of ACV helps to protect from the damage caused by free radicals. Apple cider vinegar also has anti-bacterial and anti-fungal properties. Apple cider vinegar helps to slow down the growth of a yeast like fungus called Malassezia furfur, known to contribute to both eczema and dandruff. Apple cider vinegar can be used both internally and externally in the treatment of eczema; both ways can be highly effective. However, we tend to recommend a fully integrated approach that combines both of these methods. Make a 1:1 solution of raw apple cider vinegar to water. Using a cotton pad apply the solution to the affected area. Do not wash off, instead allow the ACV to soak in naturally. Repeat steps 1 - 3 around four times a day until symptoms start to improve. Be patient when using this remedy, as with most natural treatments looking for instant results can be slightly optimistic. After around 1 week you should see signs of improvement. However, if your condition has not improved after a month it might be time to look into other options. This had got to be the easiest way to use apple cider vinegar. If you are worried about the smell of vinegar there is no need to fear. Although ACV may smell a little while you're in the bath the odour will not stay once dry. Fill a bath with warm water making sure it is not too hot as this will damage the enzymes in the apple cider vinegar. Next, add two cups of raw, unfiltered ACV to the bath water and give it a mix. Although this step is optional, we have found to be highly effective. Adding around 5 drops of tea tree oil to the bath water will not only leave you smelling lush but also speed up your healing process. It's best to stay in the bath for around 20 minutes as we want to allow enough time for the ACV & tea tree to do their jobs. Make sure once you get out of the bath to dry yourself well using a clean soft cotton towel. Repeat this every other day until symptoms have cleared. 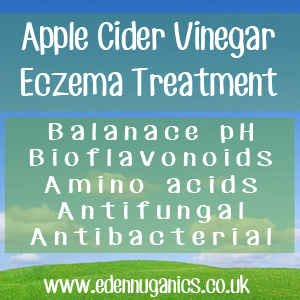 There are only so many ways apple cider vinegar can work against eczema when applied externally. Drinking ACV means our bodies can directly benefit from the minerals, enzymes and natural acids contained in this ancient elixir. Fill an 8oz glass with mineral water. Add two tablespoons of raw apple cider vinegar to the glass. Stir the ACV into the water. Don't worry about the floating bits, this is known as the mother and provides many of the health benefits. Step 4 is optional but for those of you with a sweet tooth, Manuka honey can be added at this point to sweeten the drink. Drink this 2 - 3 times a day, the best time is just before a meal where the ACV will also help with digestion. Another great and tasty way to include apple cider vinegar in our diet is to use it as a salad dressing. Combine ACV with some Balsamic vinegar and olive oil for a great tasting healthy lunch that will help to beat the bloated feeling. ACV can be added to tomato juice and a dash of hot sauce for an amazing morning drink that will kick start your day. When buying apple cider vinegar for internal health uses, it is important to look for raw, unfiltered vinegar that is contains the mother. Other pasteurized varieties are sadly lacking in vitamins, minerals and enzymes, making them of no benefit.